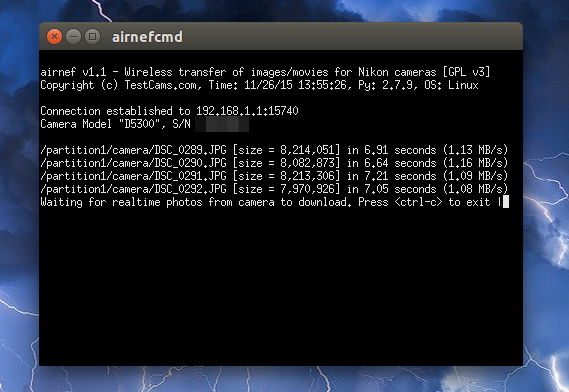 Airnef is a relatively new open source tool which can be used to wirelessly transfer photos and videos from WiFi-equipped Nikon, Sony and Canon cameras to a computer, available for Linux, Windows and Mac. 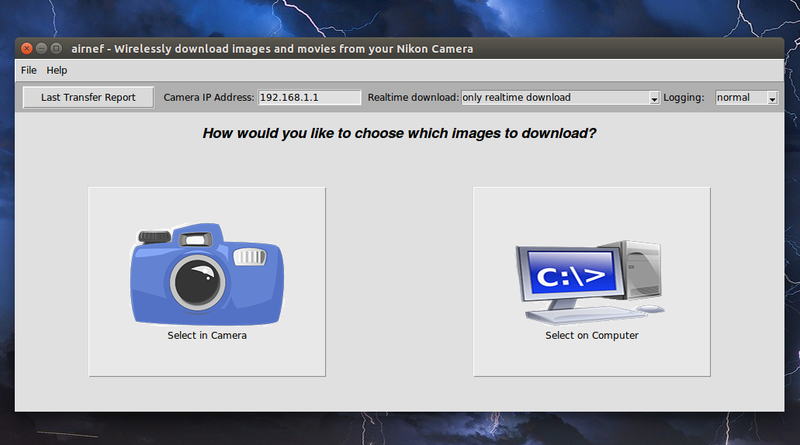 The application should work with all Nikon cameras that have built-in WiFi interfaces as well as external Nikon WiFi adapters WU-1a and WU-1b. Other external WiFi adapters, like WT-4A and WT-5A, may work, but were not tested. 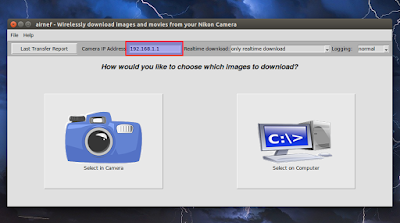 Canon cameras are also supported and with the latest version, the application got support for Sony cameras as well. Besides downloading the photos and images you've already taken, the application also comes with a real-time download mode, which allows transferring images to your computer as you shoot them, as long as your camera supports this. 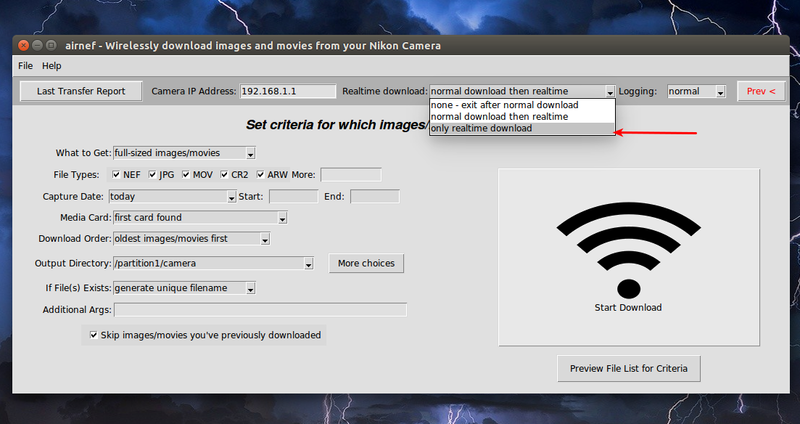 For cameras that don't support real-time WiFi shooting, a staged-real-time feature can be used, which automatically transfers the photos as soon as you turn the WiFi off - a process which can be repeated (turn WiFi off, shoot some photos, then turn the WiFi off to get the photos transferred to your computer) without any user input on the computer. various minor features such as automatically synchronizing the camera's time to the system's time each time airnefcmd is executed, and more. 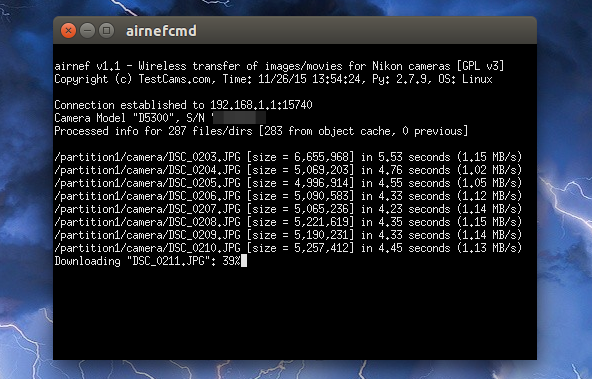 Airnef comes with a GUI, which you can use to visually select the download folder, which files to transfer and so on, as well as a command line app which can be used in scripts, etc. 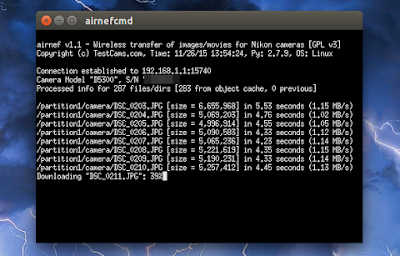 Using Airnef is pretty simple but just in case, here's how to quickly start using it. Firstly, you'll have to connect the camera to your computer's WiFi. 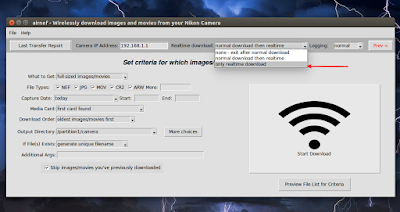 To do this, enable the WiFi on your camera and on your computer, connect to your camera's WiFi. If you're in a network where this IP is already assigned (to your router for example), you can either disconnect from the network or change the camera IP - according to Airnef's website, for Nikon cameras this can be done via a one-time procedure using Nikon's Wireless Mobile Utility app (iOS and Android). You can find exact instructions for this on Airnef's homepage. To stop the transfer, press ctrl + c in this window. For a lot more information and advanced usage, see Airnef's homepage. 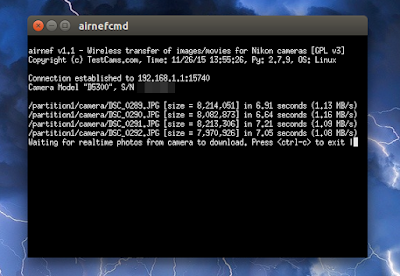 To run it, simply extract the downloaded archive and double click the "airnef" executable.